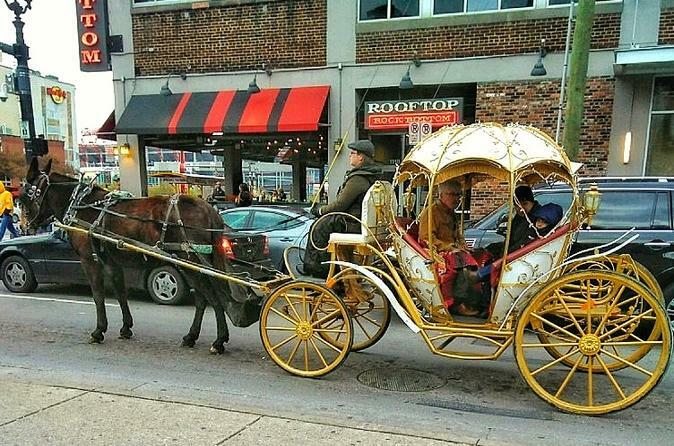 Take a spectacular ride through the streets of downtown Nashville with the city's Premier Carriage Company, Sugar Creek Carriages. You will enjoy sights like the Country Music Hall of Fame, Symphony Hall, the Shelby Street Walking Bridge, and the riverfront from one of our very luxurious carriages . Ride through downtown Broadway with it's famous bar and venues with music pouring out into streets, and check out the impressive Bridgestone Arena and Ascend Amphitheatre. Many of Sugar Creek's Carriages have been featured in music throughout the years. Come and get a taste of music city in an unforgetable classy way. See Tootsie's World Famous Orchid Lounge, where Hank Williams and many other famous folks used to frequent and Honky Tonk Central, a three-story bar featuring pub eats and live country music all day. Pass by Bailey’s, a sports bar and grille where Loretta Lynn was first discovered and Merchant’s, a former hotel turned two-floor restaurant. On your tour we will take you by Music City Center, a venue providing the downtown area with 1.2 million square feet of meeting and exhibition space, Cumberland Park, an innovative “play space” along Nashville’s riverfront and the Tennessee State Capitol, a National Historic Landmark and the John Seigenthaler Pedestrian Bridge, spanning the Cumberland River. See the iconic Country Music Hall of Fame and Museum; Acme Feed and Seed, a uniquely Nashville, multi-level eatery, bar, lounge and music venue; the War Memorial Auditorium, a 2,000-seat performance hall; and the Tennessee Performing Arts Center, home to three resident performing arts organizations: the Nashville Ballet, the Nashville Opera and the Nashville Repertory Theatre.